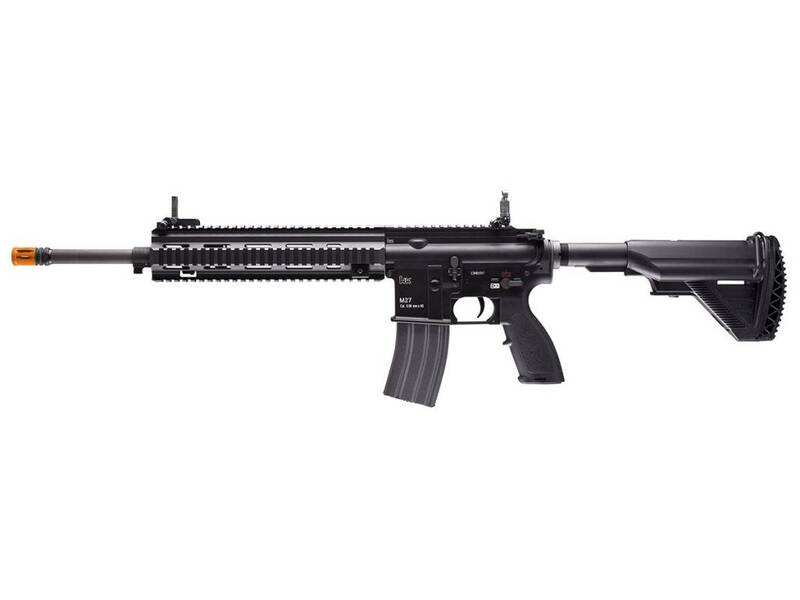 What appears to be the marksman version of the HK416 CQB is actually the HK M27 IAR. The "IAR" stands for Infantry Automatic Rifle and was designed by Heckler & Koch to replace the M249 Squad Automatic Weapon (SAW) currently used by several branches of the U.S. Military. 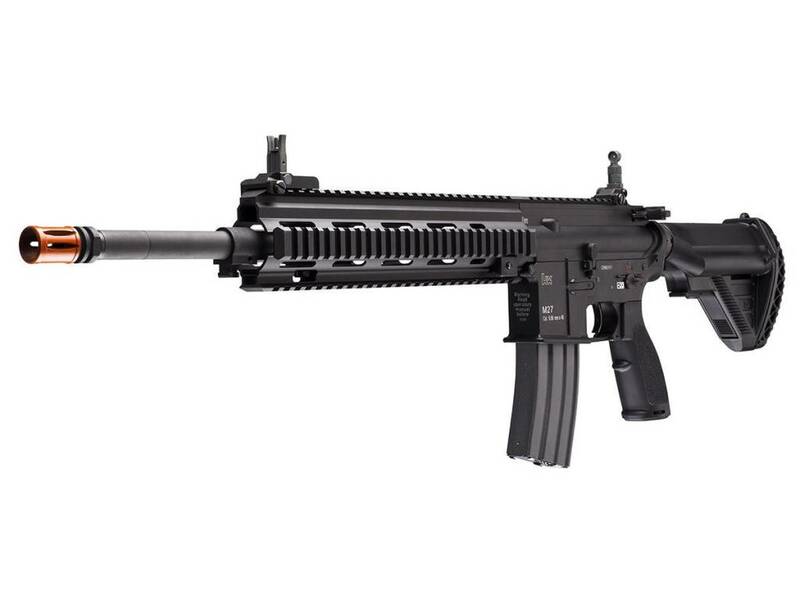 Most notably, the HK M27 IAR has been adopted by the United States Marine Corps to provide Marines with a lighter weight, fully?automatic, magazine?fed support weapon that allows the shooter more maneuverability and increased accuracy while providing suppressive fire support to advancing troops. 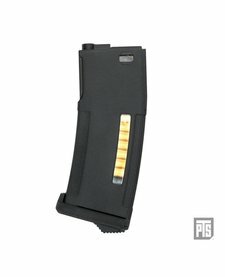 The airsoft version is now in its 3rd generation of improvements, which features internal enhancements like an improved tappet plate and piston, as well as an advanced MOSFET to provide electronic circuitry protection when using high?voltage Lithium Polymer batteries. Additional internal features to note would include a reinforced metal gearbox, steel gears, enhanced rotary dial hop?up, and an extended inner barrel for better accuracy at longer ranges. 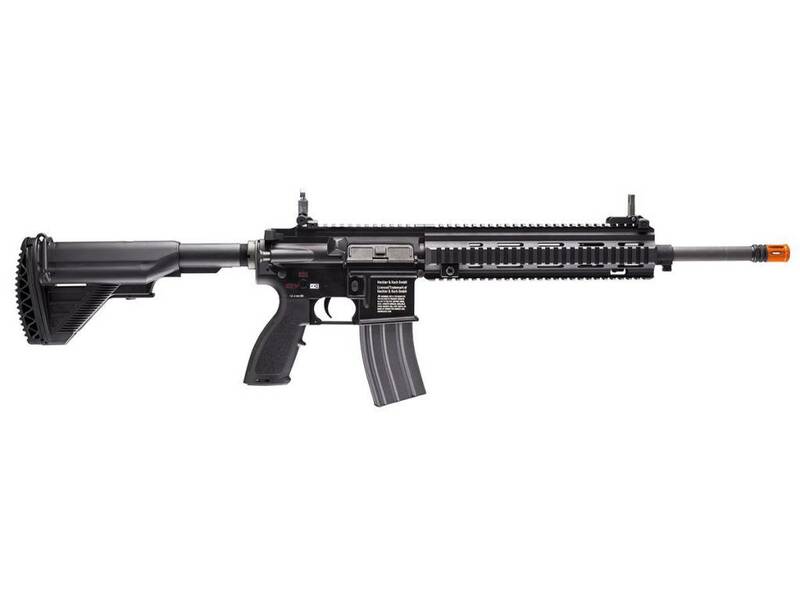 Externally, the HK M27 IAR features a 16.5" outer barrel and 9" handguard with plenty of Picatinny rail space to add virtually any accessory you wish to compliment your rifle's performance and aesthetic. 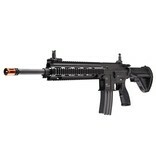 Signature HK buttstock and motor grip make this a very comfortable rifle to wield, while the low?profile flip?up iron sights, complimented by licensed HK trademarks on the receiver make this rifle rather easy on the eyes as well. 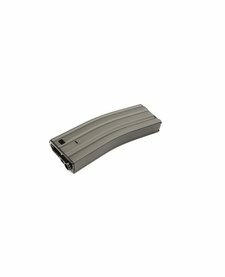 The HK M27 IAR accepts most standard M4 magazines, though best suited for use with the HK 300?round high capacity magazines with enhanced winder. 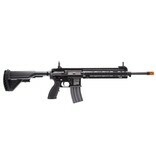 More & more local fields and milsim event companies are recognizing this rifle as a true squad weapon, allowing the player to fire on full auto during games where strict rules are in place regarding the types of rifles allowed to fire on semi?auto vs full?auto. Just as the firearm version was designed to do, the HK M27 IAR airsoft AEG makes a great option for anyone looking to fulfill a support gunner role without having to lug around the 25?pound M249 SAW all day under tough game & field conditions. With a one?year manufacturer warranty included, gain the confidence to hold that trigger down just a bit longer for extended bursts of full?auto fun on the field.